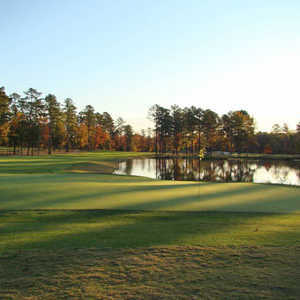 NORTH AUGUSTA, S.C. - Mount Vintage Plantation & Golf Club is way out in the sticks about halfway between Augusta, Ga., and Aiken, S.C., and about 165 years from the here and now. You enter the old clubhouse, built in 1840 by a cotton planter named Thomas Lewis Shaw, to find centuries-old, wide-plank, heart-of-pine floors and walls and two gas fireplaces burning to ward off the late- fall Carolina chill. Dramatic elevation changes add to the challenge of playing Mount Vintage Plantation. The plantation itself is in historic Edgefield County, where General Sherman missed some of the oldest historical records in the state when he burned the courthouse on his bloody march to the sea. The Cherokee nation used to roam wild and free here, as did, in later years, Strom Thurmond. At the end of the Reconstruction era, the area was known as a hotbed of duelers. Now it's roamed mainly by foxhounds and golfers, and the only dueling is between the golfers and the course, which winds up, down and through the hills of the old plantation. There is considerable elevation change here, but your main challenge will be the greens. They are sloped, undulating and tough to negotiate in normal conditions; when the winter weather makes them slick as the hood of a wet Volkswagen, it doubles the fun. "It really takes the level of challenge to a whole different level," said Club Manager Brian Thelan. "It influences everything else in your game. I'd say it plays three to four strokes harder this time of year." Club member Ed Gall is even more succinct: "We have more than a few greens that you can four-putt," he said. "Putting is definitely the key here." The greens are bentgrass and roll firm and true, but there are few easy putts here, especially on those downhill killers. It's not hard to slide one 12 feet past the hole. 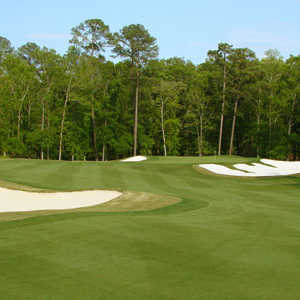 Most greens are approached from way down below and are well-guarded by bunkers. This is one course where you really need to pay attention to the pin placements and yardages. You want to be as close as you can. Just as there are no easy putts, there are few even lies; the locals say there are only 18 even lies in the whole layout - on the tee boxes. This part of South Carolina is naturally hilly, and architect Tom Jackson didn't have to call in heavy machinery to give the course its character. On parts of the course you can see for miles over the South Carolina and Georgia scenery. The fairways clamber all over the rolling terrain, twisting and turning. The good part for the mid- to high handicapper is that most tee shots are downhill, though you'll usually be faced with uphill approaches to the greens. "It's not an overly difficult golf course," Thelan said. "It's fairly wide open and there are areas around the greens if you miss." Promotional brochures for the course quote Byron Nelson as praising Mount Vintage's magnificent layout. The LPGA thought highly enough of the course to hold a tournament here for four years. With green fees of around $65, this is a terrific bargain. The greens are difficult, especially for the first-timer, but the rest of the course is very playable, even with the considerable elevation changes and slope ratings of 138 from the black tees and 130 from the blues. There is enough water to keep it interesting and plenty of risk-reward options, like a number of doglegs that can be cut. 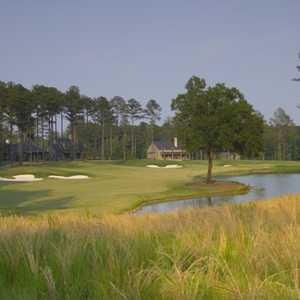 It's a very picturesque course, with tall, stately Carolina pines and only a smattering of homes along the perimeter. There is more building going on, but neighborhood covenants are designed to prevent them from being intrusive. It's no Augusta National, but regulars say the course is at the top of the second tier. "It used to be people thought it was the second-best course around," Gall said. "Now, there's Sage Valley and Champion's Retreat, and some people think they're better. But I never get tired of playing here." The Radisson Riverfront Hotel is in downtown Augusta, with South Carolina just to the east across the Savannah River. The city's riverwalk meanders right by the hotel, and the crowds show up here the first Friday of every month, a social event known here as, what else, First Fridays. The 237-room hotel offers two whirlpool suites, a business center, in-room high-speed Internet (for about $10) and 45,000 square feet of meeting space in 22 rooms. It's a good, central location for playing Augusta's golf courses and is within walking distance of shops, restaurants, museums and marinas. Augustino's at the Radisson has a pasta bar every Friday evening and Sunday brunches. It's an Italian restaurant serving a variety of steaks and chops and other entrees such as salmone alla aglio e burro (pan-seared Atlantic salmon), beef tournedos, veal scallopine, and chicken picatta. Another nine holes are planned, which would make Mt. Vintage a 27-hole facility. The target date for completion is the 2007 Masters.